Quest is an annual quiz competition for the students from special schools of Deaf in Mumbai and from other cities in the country. Quest was conceptualized more than a decade ago as a fun learning exercise for Deaf students.The consequences of this has led to an increase in reading habits along with other knowledge enhancing activities like surfing the internet. 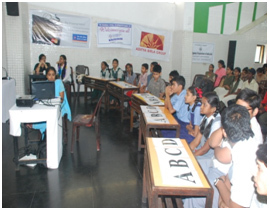 The students are quizzed on various aspects like science, history, general knowledge, languages etc. The three winning schools get trophies and all the participating teams walk away with gifts.